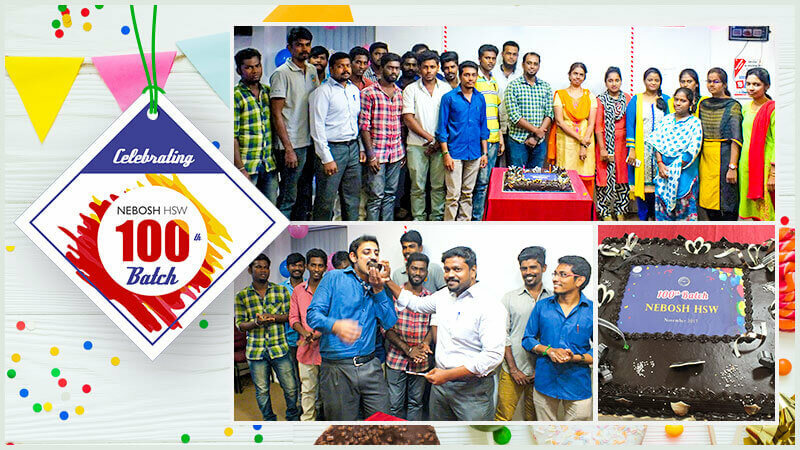 We are very happy, excited and really proud to announce that NIST had just celebrated NEBOSH HSW 100th Batch on October 26, 2017 in Chennai. It is an exciting moment for NIST to achieve a milestone in our training. The celebrations started with a brief introduction about NIST, Course highlights and students placements by our HSW trainer Sathvik and followed by cake cutting to rejoice the sweetened moment. We have been training NEBOSH HSW since two years and as of 100th batch we have successfully trained above 1643 number of students all over India. This shows our academic excellence and standards among other institutes. This is one of our major Success stories that is to be inscribed in our portfolio. This greatest success doesn't occur in an overnight. It requires immense effort and continuous support to make this happen. Our Trainers, Coordinators, Students, entire NISTians and every hard worker behind the screen are all responsible to reach this gigantic victory. We heart fully thank everyone who are responsible for this achievement come true. It is a remarkable footprint for NIST to come across 100th batch in HSW training and still the path is a long way to go through many more milestones and achievements.